Trudier Harris is the J. Carlyle Sitterson Professor of English at the University of North Carolina at Chapel Hill. She has lectured and published widely in her specialty areas of African American literature and folklore. Dr. Harris has published articles and book reviews in such journals as Callaloo, Black American Literature Forum, Studies in American Fiction, and The Southern Humanities Review. Her authored books include From Mammies to Militants: Domestics in Black American Literature (1982), Exorcising Blackness: Historical and Literary Lynching and Burning Rituals (1984), Black Women in the Fiction of James Baldwin (1985, for which she won the 1987 College Language Association Creative Scholarship Award), Fiction and Folklore: The Novels of Toni Morrison (1991), The Power of the Porch: The Storyteller’s Craft in Zora Neale Hurston, Gloria Naylor, and Randall Kenan (1996), Saints, Sinners, Saviors: Strong Black Women in African American Literature (2001), and South of Tradition: Essays on African American Literature (2002). She co-edited three volumes of the Dictionary of Literary Biography series on African American writers and edited three additional volumes. 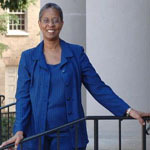 She edited New Essays on Baldwin’s Go Tell It on the Mountain (1996) for Cambridge University Press and co-edited The Oxford Companion to African American Literature (1997), Call and Response: The Riverside Anthology of the African American Literary Tradition (1998), and The Literature of the American South: A Norton Anthology (1998).